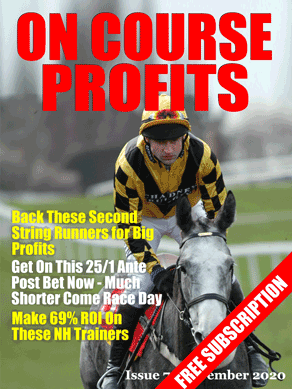 I've just been reading an article by Josh Wright where he shares a jockey angle to profit from. Basically he's uncovered three jockeys that do exceptionally well in races of 3 miles and longer. …all three are clearly superb judges of pace, either winding up their mounts from the front or pouncing at the right time to take the prize. They also give their horses confidence at their fences as well as getting the firepower to go to war with. The three jockeys are James Reveley, Paul Moloney and Paddy Brennan. James Reveley has had a consistent record for some time in these types of races and is a superb horseman as well as a great judge of pace. His mounts should always be kept onside during main National Hunt season over these marathon trips. Paul Moloney is renowned for waiting out the back on his mounts and timing his challenge perfectly. To perform 77% above market expectations says everything about his ability to win on horses that the market has not given a chance to. His rides in long distance handicap chases are always worth a second look. Handicap Chases, 3 miles to 3 miles 4 furlong inclusive. Paddy Brennan is a superb rider over 3miles-3m4f in the lower classes of racing. He is best known in recent years for his association with Tom George, however he also gets plenty of rides for Fergal O’Brien and the odd ride for other trainers. Definitely a rider who gives confidence to his mounts and who judges pace superbly. He is still underestimated by the market. These 3 have won nearly 400 points to BFSP since the beginning of 2010 and they are showing no signs of stopping anytime soon.